EdX does not support this problem type. In an annotation problem, you highlight specific text inside a larger text block and then ask questions about that text. The questions appear when learners move their cursors over the highlighted text. The questions also appear in a section below the text block, along with space for learners’ responses. Before you can add annotation problems to your course, you must enable annotation problems in Studio. To enable annotation problems in Studio, you add the "annotatable" key to the Advanced Module List on the Advanced Settings page. (Be sure to include the quotation marks around the key value.) For more information, see Enabling Additional Exercises and Tools. 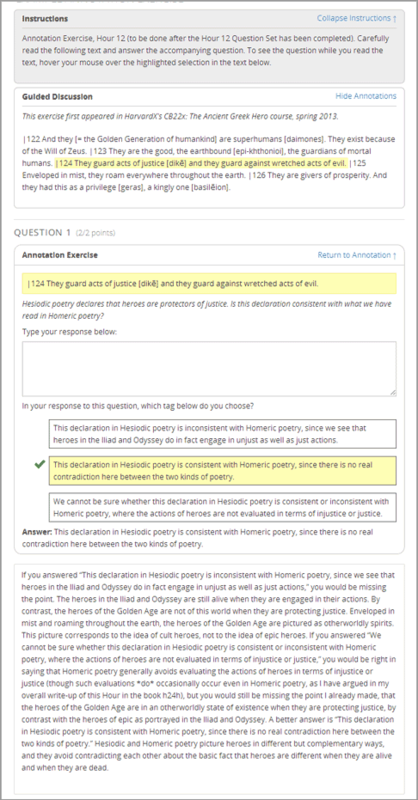 To create an annotation problem, you add the Instructions and Guided Discussion segments of the problem, and then the Annotation problem segment of the problem. To add the Instructions and Guided Discussion segments of the problem, follow these steps. In the unit where you want to create the problem, under Add New Component select Advanced. In the list of problem types, select Annotation. In the component that appears, select Edit. In the component editor, replace the example code with your own code. To add the Annotation problem segment of the problem, follow these steps. Under the annotation component, create a new blank advanced problem component. Paste the following code in the advanced problem component, replacing placeholders with your own information.